Tucked away behind the busy London Road in Sevenoaks is Lime Tree Walk, designed as ‘artisan-style’ housing by prominent Victorian architect, Sir Thomas Graham Jackson. 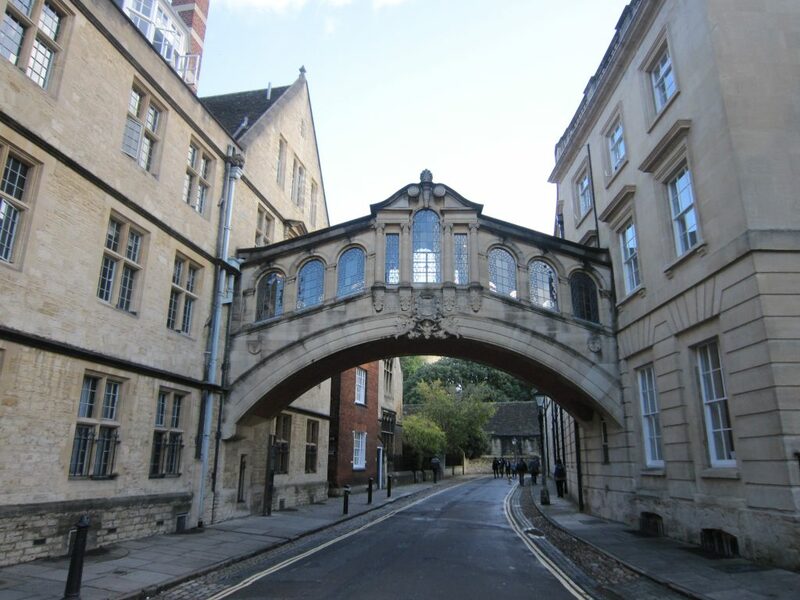 Jackson is most often remembered for his work in Oxford, including Hertford College and the famous Bridge of Sighs over New College Lane. 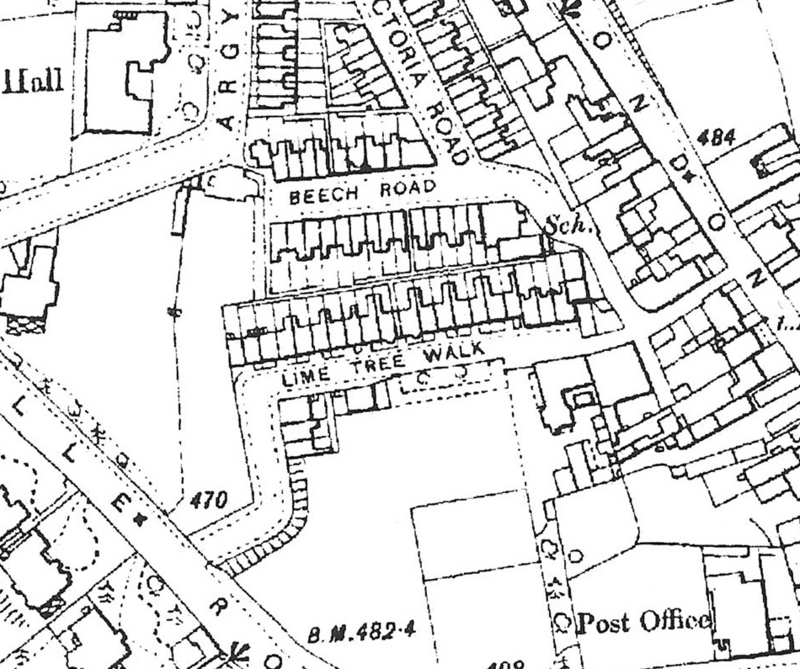 Twenty four houses were built along Lime Tree Walk in 1878-79 as ‘a housing experiment for working class people in a high class residential area’. The houses were designed and built by Sir Thomas Graham Jackson, along with his father, Hugh Jackson, to provide ‘model dwellings’ for Sevenoaks. When the houses were almost complete, in 1879, Jackson said he ‘had tried to make them beautiful within the proper limits of cottage building…with a kind simple grace which comes from plain sensible construction. Thomas Graham Jackson is known for his works in Oxford, completing several designs across the city, including the Examination Schools along the High Street, along with Trinity College quadrangle, Brasenose College, Hertford College, including the Bridge of Sighs, and many others. 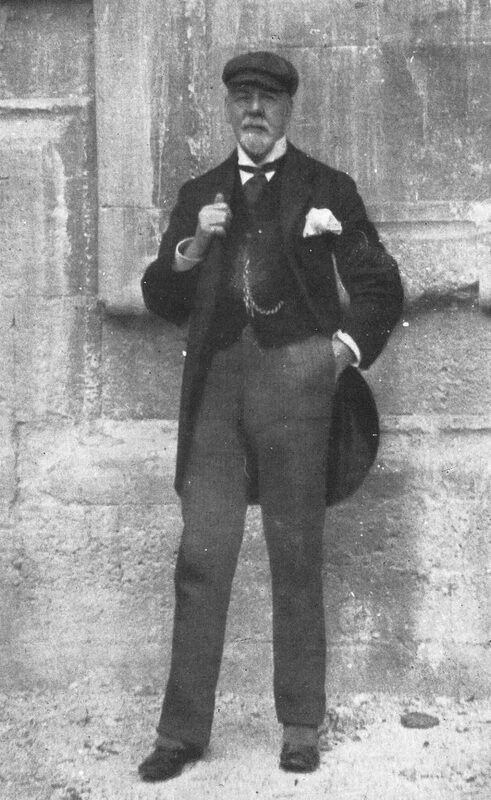 He completed so many buildings in Oxford, it was said that ‘no other architect has altered the face of Oxford so greatly.’ He was first articled to Sir George Gilbert Scott and later went on to work with another famous name, Richard Norman Shaw. 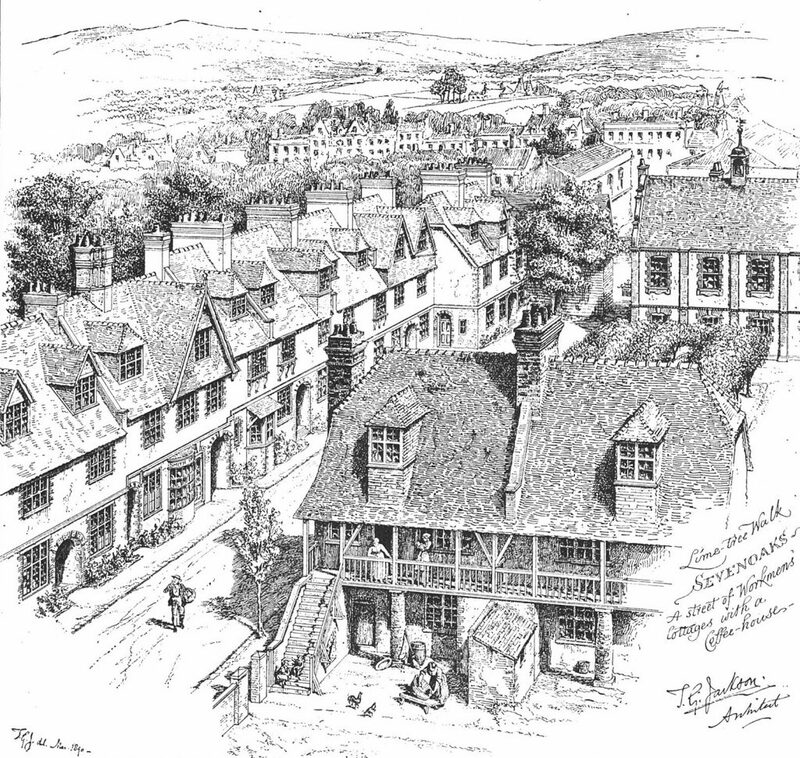 He also wrote several books and was responsible for several designs, as well as restorations and additions, across the country, including Eton, Inner Temple in London, others in Sevenoaks, and Winchester Cathedral. 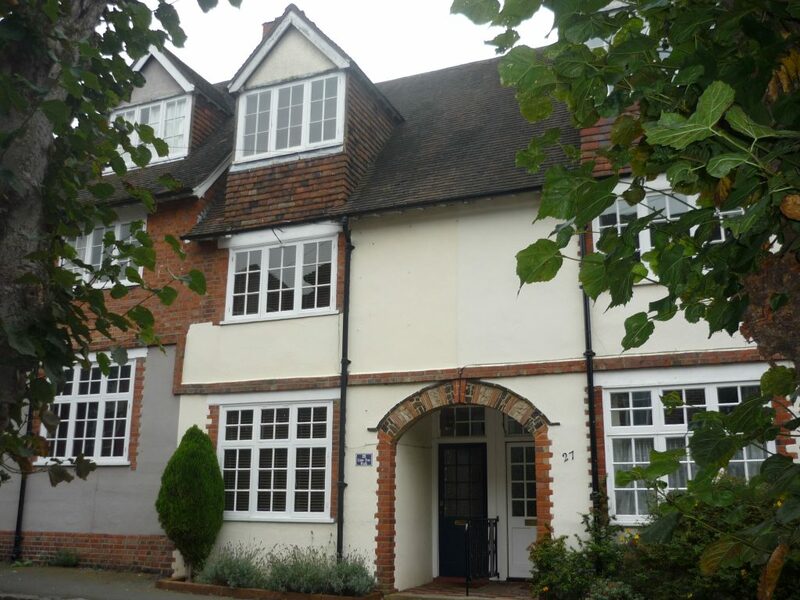 Residents had moved into the new houses along Lime Tree Walk in Sevenoaks by the time the census was taken in the spring of 1881 and this reveals many of the first residents were craftsmen and women and working-class families. Amongst these early residents were carpenters, grocers, gardeners, labourers, bricklayers, dressmakers, shoemakers, as well as sewing machine operators, journeyman bakers, and telegraph messengers. The residents along Lime Tree Walk continued from similar walks of life throughout the late 19th into the early 20th century, and meanwhile Sir Thomas Graham Jackson continued as the owner until his death in 1924. Alongside the houses by Thomas Jackson, Lime Tree Walk also featured a Coffee House, built in 1882, which later became the ‘Lime Tree Temperance Hotel’. It was also used as the headquarters of the local cycling club during the late 19th and early 20th centuries, when cycling had become the newest and latest craze. It even features a cycle themed weathervane! Today, this row of ‘workmen’s dwellings’ are Grade II listed and have become a popular residential area in the centre of Sevenoaks. With just a few days to go before Christmas, it seems appropriate that I post a blog with a Christmas connection. However, sadly, I don’t have a house history directly related to Christmas, so instead I’ve looked to a man who is often synonymous with Christmas, the author of A Christmas Carol – Charles Dickens! 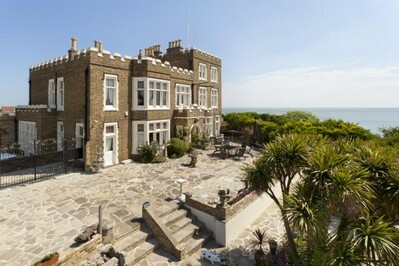 Today, Bleak House is noted for its crenelated appearance with a long row of windows looking out towards the sea, but when Charles Dickens stayed in the house it was known as Fort House and appeared much like a typical Georgian house. It was built around the turn of the 19th century and acquired the name ‘Fort House’ as it is believed it was the home of the Fort Captain. This was at a time when the Napoleonic wars were raging in Europe and like many coastal locations there was a genuine fear of invasion from across the seas. The house was built here for its ideal location as a look-out, but also the height meant it was also ideal for a telegraph station. Dickens first came to the house in the early years of Victoria’s reign, around 1837, when Broadstairs had become a popular seaside resort and the house had become a lodging house. He visited regularly, and it was while staying at Fort House that he completed parts of some of his most well-known novels, including Nicholas Nickleby (1839), Dombey and Son (1848) and David Copperfield (1850). It was also while staying here that Dickens began working on the novel that would later give the house its name – Bleak House – published in 1853. 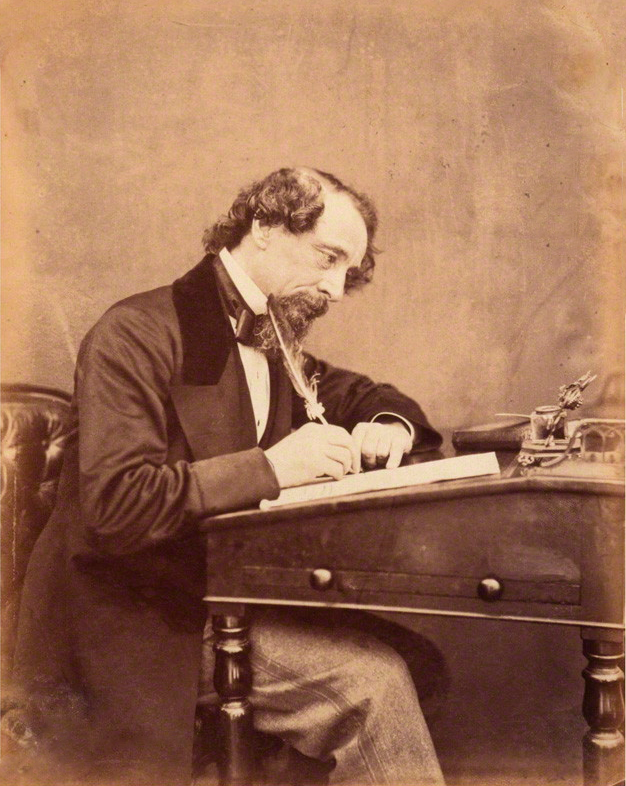 Dickens visited Fort House with his family many times, but he also hosted several other famous names of the 19th century, including former prime minister, William Gladstone, as well as another Victorian novelist, Wilkie Collins, and his biographer and friend, John Forster. It is also thought it may have been visited by the Danish fairy tale author, Hans Christian Anderson. Dickens is believed to have much favoured Fort House (although he stayed in other houses in Broadstairs) and is believed to have said it was the one ‘on which he had always set his affections’. It was in the early years of the 1900s that Fort House was extended and re-fronted to what we recognise today. 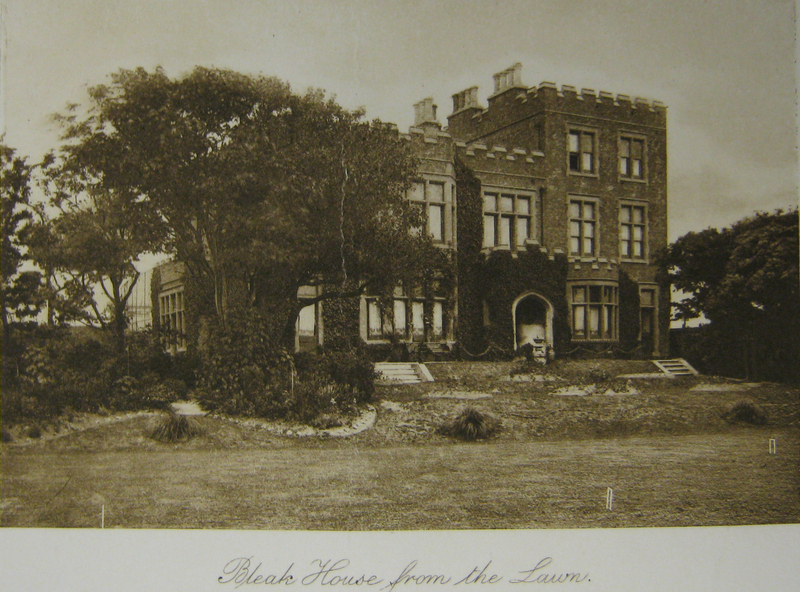 It was also at this time that the house was given the name ‘Bleak House’ and was recorded as such in the 1901 census. There are some theories that the house was used as inspiration for the Bleak House in his novel, although others have disagreed and suggested it is more likely the former residence of the author that inspired the creation of the name many years later. During the 20th century, the house has had a number of extensions and renovations, although it is believed it still retains the original mahogany staircase and fireplaces. For much of the 20th century it has had a variety of uses and was both a residential home and also the Thanet smuggling museum and Dickens memorial museum. Since 2012 it has been reopened as a guest house and wedding venue, and accepts short term visitors to Broadstairs, much as it did in the 19th century when Charles Dickens came to stay. On a day when the launch of the electoral campaign for the 2015 elections is dominating the headlines I am reminded of a house I researched several years ago that has some unexpected links with UK politics. In the 1930s it was the home of an early female Member of Parliament and later in the 1960s it was the home of prominent sculptor, Uli Nimptsch, responsible for the statue of David Lloyd George in the House of Commons. 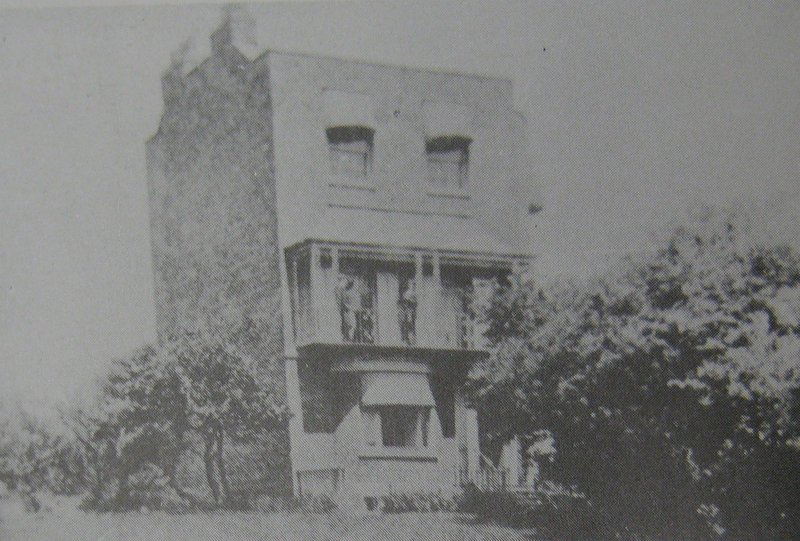 The Victorian house (researched for Chesterton Humberts – now Chestertons), situated along Fulham Road in London, was first built when the area was still predominately covered with fields and market gardens. It was completed in 1846 as part of a short terrace called ‘Lansdowne Villas’. The first resident to move into the house was Mr George Ash – dentist. At the time of the 1851 census he was recorded in the house with his wife and five children. I dread to think of the working life of Mr Ash as an early dentist – or more precisely the patients and their experiences with a Victorian dentist! Particularly when considering that anaesthetic wasn’t widely used and an official register of Dentists was only established by the Royal College of Surgeons in 1872. By the early 20th century the house was the home of Bessie Humphries, who was renting out rooms in the house. This continued through to the mid 20th century with Miss Laura Brown, who rented rooms to women, and in particular in 1930-31 the house is believed to have been the home of Mary Pickford. It appears unlikely to have been the Hollywood film star Mary Pickford, but rather Miss Mary A. Pickford the daughter of William Pickford, 1st Baron Sterndale. Mary Pickford took an active role in community and political activities from a young age and during the war (interrupting her studies at Oxford University) she worked as a factory inspector for the Home Office. In 1929 she stood as a Conservative candidate for Farnworth but was unsuccessful, but was invested as a Commander, Order of the British Empire (CBE) later that year. Mary once again stood as a Conservative candidate, in the 1931 General Election, when it is believed she was living in the house along Fulham Road, and this time was successful, becoming MP for Hammersmith North. However, sadly Mary Pickford only held the position for three years as she died suddenly in 1934. However, it was after the World War Two that the house became the home of it’s most famous resident, sculptor, Uli Nimptsch. Uli (full name Julius) was born in Germany and studied in Berlin, Rome, and Paris during the 1920s and 30s, but moved from Nazi Germany in 1939 for the sake of his Jewish wife, Ruth. Uli and his family settled in the house on Fulham Road in 1948 where he established himself as a noted sculptor, particularly famous for his female sculptures and portrait busts. It was in the 1960s that Uli received his most prominent commission – to create an over life size sculpture of former Prime Minister, David Lloyd George. The statue was completed in 1963 and was unveiled in the Member’s Lobby on 18 December by the Prime Minister Sir Douglas-Home. It stands prominently at the entrance to the House of Commons opposite the statue of Sir Winston Churchill. Both statues famously feature a worn foot as it is the custom for MPs to rub the foot for good luck as they walk past. Uli exhibited regularly, including a solo exhibition in London in 1942, and later was elected R.A. in 1967. He was also Master of Royal Academy Sculpture School in 1966-69 and today a number of his works are held in galleries across the country, including The Tate Collection. Uli Nimptsch continued to live in the house on Fulham Road until he passed away in 1977. The statues of David Lloyd George and Winston Churchill in the Houses of Parliament.